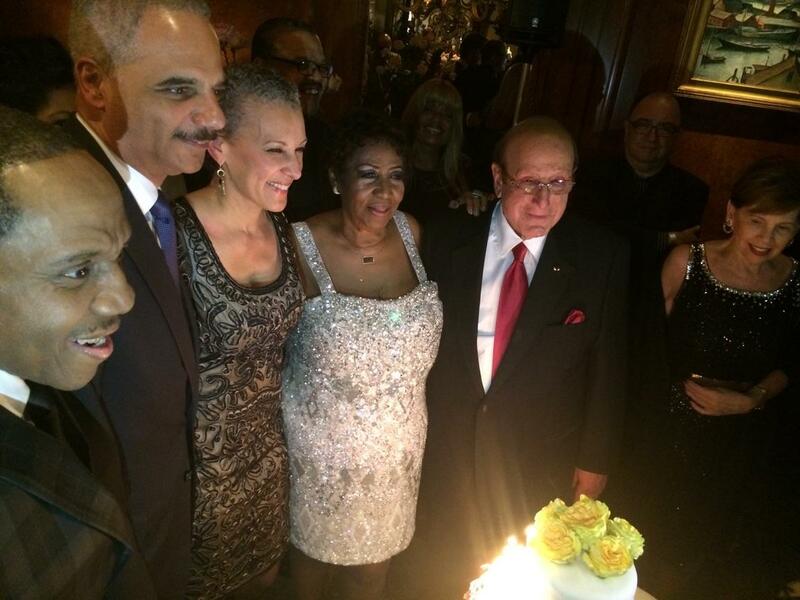 It’s not Aretha Franklin’s birthday until Wednesday, but she’s been celebrating in style. Last night at the Ritz Carlton the Queen of Soul had the hottest party in town. Her guests included Clive Davis, Valerie Simpson, Sarah Dash (of Labelle) who led the “Happy Birthday” singalong, and Freddie Jackson from the music world, plus choreographer George Faison, Sirius XM’s Tracey Jordan, and Lawrence O’Donnell and Tamron Hall from MSNBC. But from politics, the amazing Miss F brought together Attorney General Eric Holder, Rev. Al Sharpton, and Charlie Rangel. Holder and Rangel were seated on the same settee, but they didn’t have much of a conversation. Holder told me he and his wife became friends with Aretha in the last couple of years, and Franklin drove down from Detroit to Washington recently to sing “Amazing Grace” at his exit event. Wait! Aretha introduced all the guests and thanked them amidst the Duke Ellington Jazz All Stars playing, as well as singer Avery Sunshine, mimes and clowns, and New Orleans dancing girls. But she introduced Holder as “the former attorney general.” I asked him if he’d actually left (knowing the answer). “Not yet!” he laughed. This was Sunday. On Friday night, Aretha and her orchestra braved a pretty substantial snowstorm and headed to the Webster Arena in Bridgeport, Connecticut for what turned out to be a landmark show. Despite the show, the Arena was packed, and the Queen put on a show over two hours long that featured a roaring gospel segment and a rare performance of Paul Simon’s “Bridge Over Troubled Water” accompanying herself on piano. The show was so hot it melted the snow faster than the Bridgeport plows could get to it. Just a note: you do know that back in the early 70s, Franklin had a hit covering “Bridge” after Simon & Garfunkel released it. Her gospel R&B version then became the way Simon started doing it as a solo act. On Friday, you could feel the goosebumps rise, and electricity crackle in the Arena as Aretha led HB Barnum and her orchestra through a good 12 minutes. It was mindblowing. A star for over 50 years, she turns 73 on Wednesday.